Dental implants are the most durable, lifelike and long-lasting option for replacing missing teeth. 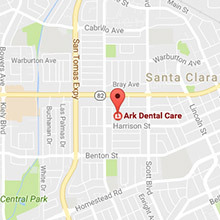 Implants function and feel just like natural teeth, and can last a lifetime with proper care. Dr. Khetani recommends dental implants as the best tooth replacement option for all patients who are able to receive them. A dental implant is a titanium post that is inserted into your jaw to function as a replacement root for a missing tooth. 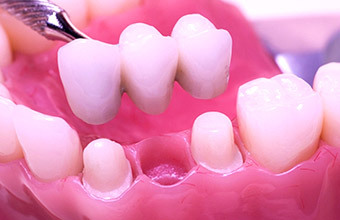 A connecting piece called an abutment is placed on top the implant and serves as the attachment point for a dental crown or bridge. 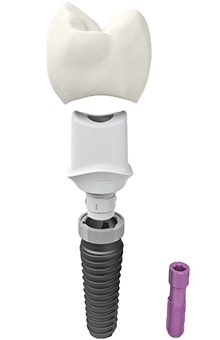 Once the implant is in the jaw, the surrounding bone tissue gradually integrates (fuses) with the implant surfaces, firmly anchoring the implant. A fully integrated implant is just as strong as a natural, healthy tooth root. Dr. Khetani is very meticulous in creating and placing the top-quality crowns and bridges that your dental implants will support. She will guide you through the entire procedure in partnership with a trusted local implant surgeon who will place your implants. Dental implants are as strong as natural tooth roots and support replacement teeth that look, feel and function just like natural teeth. Most patients cannot tell the difference between their teeth supported by dental implants and their natural teeth. Dental-implant-supported teeth have equivalent chewing and biting power to that of natural teeth. Replacing a missing tooth with a dental implant and crown removes the need to grind down and weaken adjacent teeth, as is necessary when placing a dental bridge. Teeth on either side of a gap left by a missing tooth can shift position and cause problems with bite alignment and with chewing. Implant-supported teeth fill the gap between the adjacent teeth and keep them stably in position. Dental implants help preserve the size and shape of the jaw by preventing bone loss that normally occurs around a missing tooth. 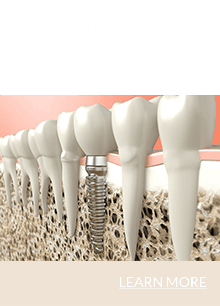 Dental implants are the longest-lasting of all tooth replacement options—with proper care they can last a lifetime. Although dental bridges have long been used to replace missing teeth, they have several disadvantages. For one, the teeth on each side of the gap have to be ground down so the bridge can be cemented onto them. This weakens those teeth and can lead to fracture, decay or other complications over time. Additionally, bridges do not prevent bone loss in the area where tooth roots are missing, and they generally last only seven to ten years. On the other hand, implant-supported replacement teeth require no grinding down of adjacent teeth. They provide the chewing pressure needed to stimulate the jaw into maintaining its bone volume. And dental implants, if properly cared for, can last a lifetime.